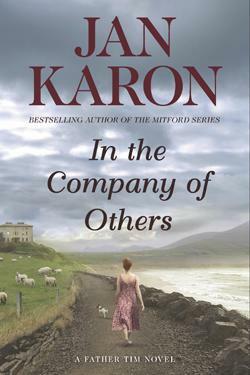 In the Company of Others is the second novel in the Father Tim series. While Father Tim Kavanaugh is the primary character, his wife, Cynthia, is prominent in this story. The other Mitford folks are mentioned only when Father Tim communicates with them. But, there were plenty of Irish characters to keep the story interesting. Father Tim and Cynthia are on vacation in Ireland, the reverend's ancestral homeland. They are settled at a cozy Irish inn. They have planned a relaxing vacation jaunting around Ireland with another couple who are on their way. But, right away, their plans are thwarted when Cynthia sprains her ankle. Bad goes to worse, and they never do get to travel as they planned. However, they are not bored because get involved in Irish family secrets and a crime investigation. And, Father Tim finds that a man of the cloth can never really take a vacation from saving souls. I've loved all of Jan Karon's books, but I was disappointed in this one. Like many other reviewers, I missed the folks in Mitford. But, that wasn't my biggest problem with In the Company of Others. It started slow, and I had hard time maintaining my interest. The story was interspersed with entries from the journal of an Irish doctor, trained in America, who had lived in the area. I found the journal sections irritating. I felt that they interrupted the story and that the information provided in the entries could have been provided in some more interesting way. And, toward the end, Karon used an peculiar writing technique. For example: "Warm, humid: birdsong in the beech grove." It felt like she had outlined this section and had never come back to finish it. These incomplete sentences increased in frequency toward the end of the book. Perhaps, she thought it added to the suspense. I just know it became very annoying for me. It's a good story, but, again, it wasn't as good as Karon's earlier books. And, I'll still want to read her next one.